The Bridge Spring Trail makes a great winter hike to a rare natural bridge in the Eldorado Mountains, south of Boulder City and near the small town of Nelson. Deborah Wall A rare natural bridge can be found in the Eldorado Mountains near Nelson, about 25 miles south of Boulder City. This is a good, moderately strenuous hike for the entire family, as long as everybody can hike about 2 miles round-trip and do some rock scrambling. The trailhead is at about 3,510 feet elevation, so it will likely be about 5 to 10 degrees cooler than in Las Vegas. You will lose about 200 feet in elevation on the way to the bridge. 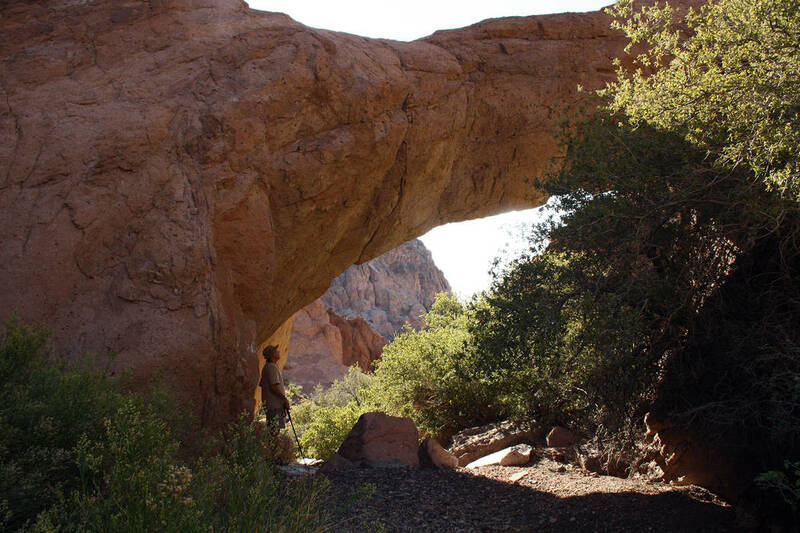 Natural bridges are rarer than arches. Arches can be formed by various geological processes, but natural bridges are all formed by water and either span a waterway or did so in the past. From the unsigned parking area, follow the gravel road east to the end, about 0.2 miles. Head toward the ridgeline on the faint but obvious trail. The trail gently undulates for the first quarter mile, and then you will drop into a well-defined wash, which will serve as the trail for the rest of the hike. After you drop into the wash, you will go left or downstream. Please be sure to turn around and remember where you entered, as it can be confusing on the return. After about one-half mile, you will come to a giant boulder I estimate to be about 25 feet tall and 15 feet wide. It seems very out of place and seems to defy gravity and looks like, if you pushed on it, the boulder might fall. Just after this you might start to see water, and you’ll find more vegetation such as healthy and large scrub oak. Wildlife find this a reliable water source, so one might see bighorn sheep, mountain lions, bobcats, chuckwalla lizards or rattlesnakes — or, more likely, their tracks. One interesting and rarely seen creature that likes this wet, rocky area is the Gila monster, a poisonous lizard. They should be in or going into hibernation soon, but come springtime they will be back out. They are often about 1 to 2 feet long and black with splotchy patterns in pink, orange or yellow. Despite their sinister reputation, Gila monsters are a protected species, so if you are so fortunate as to see one, leave it alone. The wash gets rockier and the vegetation becomes quite dense as you approach the bridge. To get a good look at it and stand underneath, you’ll most likely have to do a bit of bushwhacking. It seems to me easier to do that along the left side. Watch the kids in here, though, as there are some drop-offs and some places you’ll have to scramble over the rocks. I estimate that the bridge spans over the canyon about 30 feet across and the opening about 15 to 20 feet high. If you are up for more adventure and more difficult scrambling over large boulders, you can hike past the bridge down the drainage. For experienced hikers and climbers only: You can do a tricky climb up on the left-side cliff and take in some far-reaching views. You can see down Eldorado Canyon to Lake Mojave and even see Mount Tipton located just south of Dolan Springs, Arizona. On your return, if you have the time, there are some interesting spur canyons worth exploring. Most are short, slotlike and boxed in and especially fun for children. From Boulder City, take U.S. Highway 95 toward Searchlight. Drive 9 miles and turn left on Nevada Route 165, toward Nelson. Drive 9.4 miles and go left onto the unsigned gravel road for parking and the trailhead. Park here or, with a high-clearance vehicle, drive 0.2 miles on the gravel road to a secondary parking area and trailhead.